Firm tofu cut into cubes and deep-fried in starch. Served hot, typically with tentsuyu. 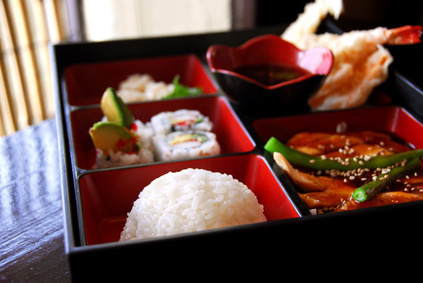 Combination of side dishes with rice served in a plastic or wooden lunch box. It is the most common kind of food eaten for lunch outside home in Japan. Smorgasbord or buffet. 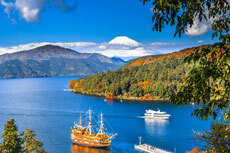 The word comes from "viking", the name of the first Swedish restaurant in Japan offering smorgasbord. Okinawan stir fry dish, generally containing vegetables, tofu, and some kind of meat or fish. 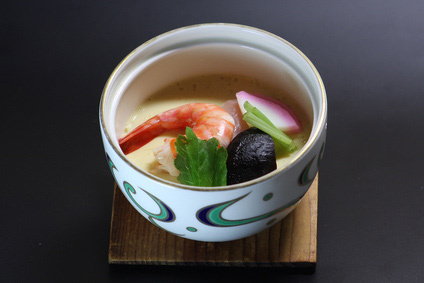 Egg custard dish with seeds of ginkgo, shiitake mushrooms, kamaboko, boiled shrimp and other ingredients. It is eaten as an appetizer or as a side dish alongside sushi or other dishes. Cylindrical stick of steamed or broiled fish surimi, salt, sugar, starch, and egg white. Instant noodle sold in supermarket or "combini" (see Ramen). Big white raddish used a lot in Japanese cooking. Rice dumpling made from mochiko (rice flour) and typically served on a skewer and accompanied with green tea. Broth soups used abundantly in Japanese cooking. 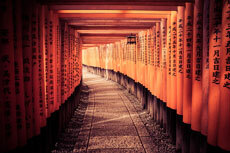 The three most common dashi are made from dried kombu, niboshi, or shiitake. Boiled green soybeans, served salted as a side dish or appetizer. Greater burdock (thin grayish-brown root vegetable). Slices of beef simmered in soy sauce laid on rice. Boned fish or seafood dish dipped in a sweet shoyu-base sauce before being broiled on a grill. 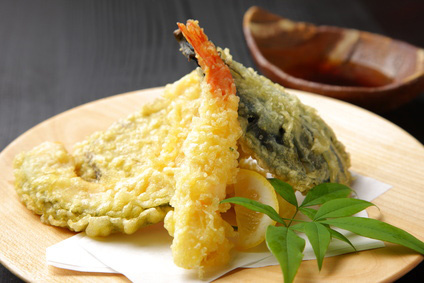 The most common kind of kabayaki is made with unagi (eel) or iwashi (sardine). 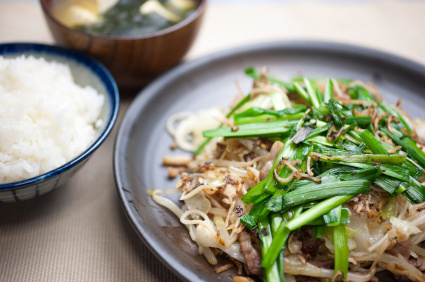 Braised pork dish of Chinese origin and famous in the region of Nagasaki. It literally means "square simmered". A type of cured white fish surimi combined with additives such as MSG. Typically served as sliced half cylindrical loaves. Rice cooked in an iron pot, usually with vegetable and meat. 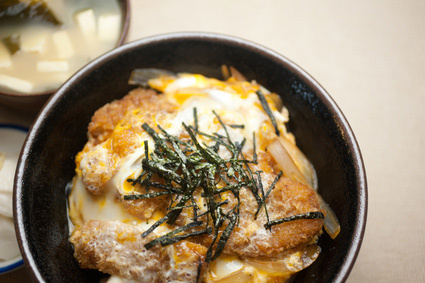 Battered pork cutlet with eggs on rice. Cooking style : "sautéed and simmered". Dried daikon cut in strips and simmered. Edible kelp (East Asian variety). Gelatin-like food made from the starch of "konnyaku potato". Finely-milled green tea (as used in the tea ceremony). Soybean paste used a lot in Japanese cooking, such as in "miso soup" or "miso ramen". Rice cake made of glutinous rice pounded into a thick and sticky paste. It is commonly eaten for the New Year. Hot pot dish. It is usually eaten in winter. 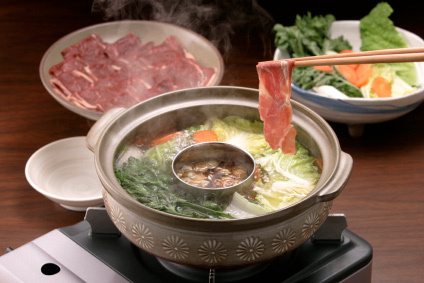 Sumo wrestlers notoriously eat a lot of Chankonabe (nabe with meat, vegatable and udon) to gain weight. fried mackerel marinated in vinegar and other ingredients. 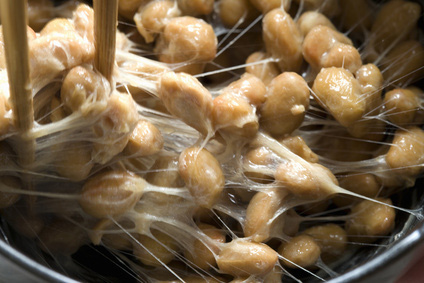 Fermented soybeans with a pungeant smell, that Japanese an foreigners alike usually love or hate. 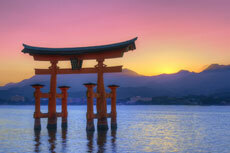 It is more popular in Eastern and Northern Japan than in the rest of the country. Dish of meat, potatoes and onion stewed in sweetened soy sauce. Stew-like dish with ingredients such as konnyaku, daikon, chikuwa, hard-boiled eggs, tofu cubes, etc. simmered in flavoured stock. Small side dish of fish, meat, vegetable, or tofu. A main course in Japanese home cooking or restaurants such as izakaya is typically composed of several "okazu" accompanying rice. 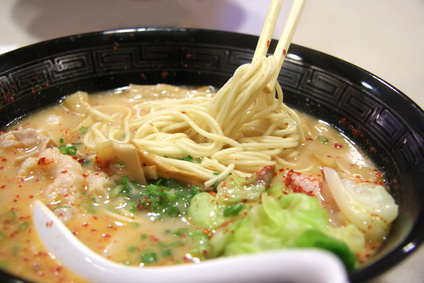 Chinese/Japanese noodle typically served in soup with vegetable and meat. 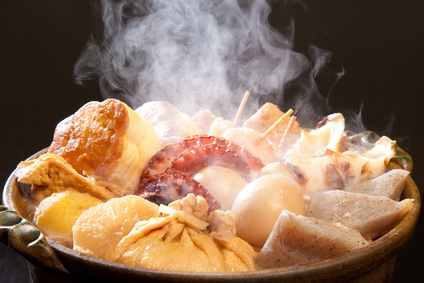 Hot pot dish related to the Chinese fondue and the sukiyaki. 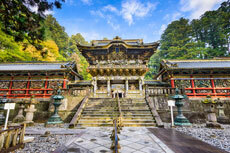 Thin slices of meat and vegetables are boiled in a common pot, then usually dipped in sauces. Soy sauce. 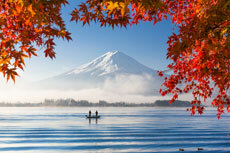 One of the most common ingredient in Japanese cooking. 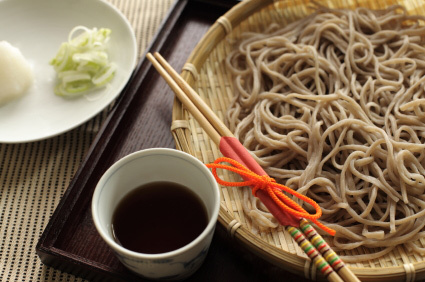 Buckwheat noodles. They can be eaten warm, but more commonly cold in summer. They are not eaten with sauce or broth, but simply with tsuyu. Bowl of rice covered with sliced omelette and minced chicken simmered in dashi, soy sauce, sake and ginger. Hot pot dish with tofu, negi (scallion), sliced meat (usually beef), konnyaku noodles, mushrooms and Chinese cabbage. The food is then dipped in a small bowl of raw, beaten eggs before being eaten. 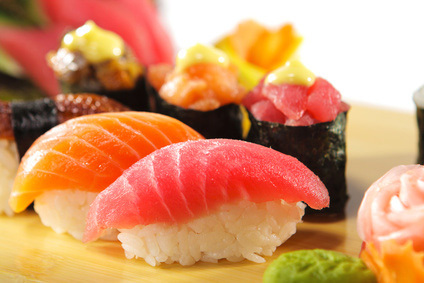 Fish-based food product intended to mimic the texture and color of the meat of lobster, crab and other shellfish. Very hot Sichuan-style ramen with a reddish, spicy chilli and sesame soup. Deep-fried food, usually seafood or vegetables, dipped into flour-and-water batter. 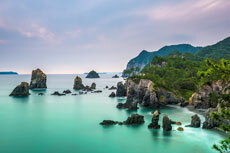 Of Portuguese origin, although it has become a "traditional" Japanese dish since its import in the 16th century. Pieces of tempura laid on rice in a bowl. Burgers made of minced chicken, sometimes mixed with tofu. Dipping sauce, made of dashi, mirin and shoyu. Thick wheat-flour noodles served in a hot soup. Sour pickled plum served with dishes such as "bento" and thought to help digestion. Sweet alcohol made of "ume". Japanese plant with green roots tasting like strong horseradish and used in cooking in the form of green paste. 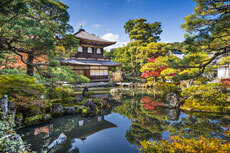 Many people call it "Japanese mustard", although it is not related to the mustard plant. 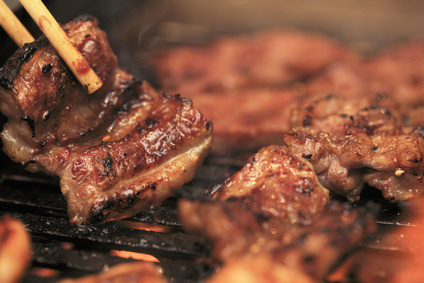 Grilled meat, typically thin slices of beef. Also known as Korean BBQ. 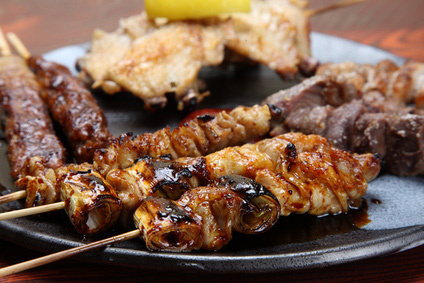 Pieces of chicken grilled or barbecued on a skewer. Sour citrus fruit shaped looking like a yellow-greenish mandarin or a small grapefruit.